The TrikeBuggy A-Assists enable the user to inflate the paraglider without pushing the A risers upward with their hands. The Assists pull the center "A" risers from the mallion when the riser is back, and has no effect when the paraglider is overhead during flight. See the A-Assists in action! The second and more important benefit that these A-Assists offer is pulling absolutely equally on both A risers. Quite often, a pilot is stronger with their right or left arm strength, and therefore they sometimes inflate the glider faster on their strong side. Add the extra element of a throttle in one of the hands, trying to manage the input of that as well. Often, a pilot will compound an imbalanced inflation by seeing the wing shooting off to one side, so they pull down on that side to correct it. Problem is, they usually have not let go of the A risers yet, since the wing is not yet overhead. The result is that they accelerate the left side even more by pulling on the A riser on that side. Not good, and time to kill the motor! With A-Assists, the glider is always given the same input, time after time: Equal pressure on the A risers on both sides until the glider is overhead, where the Assists become neutral. We still have to deal with the prop wash, and this sometimes causes the wing to surge to one side. The inflation will always be slightly different each time, due to the nature of the blast of wind produced by the propeller, but the benefit of this single feature makes the A-Assists perhaps our most important accessory. The A-Assists have been shown over and over to be highly effective, not to mention easing the strain on the shoulders from lifting the front risers. Now you can simply sit down, fasten your seat belt, grab your throttle and brakes and go! 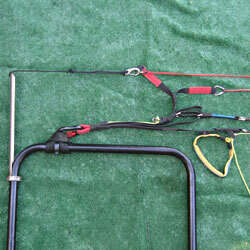 These assists attach to the front portion of the Power Loops and stick up above the top level of the Loops. The clips attach the cord from the top of the A-Assist upright to the A risers, effectively "lifting" the A's overhead. To properly adjust the A-Assists, care must be taken to make sure that the assists are in the neutral (no tension) position when the riser is straight up in the flying position. The Assists should not affect the wing when it is overhead, only when it is behind the buggy during the inflation. Make sure that the knot does not slip or move when tension is applied. This strap will NOT be adjusted in flight, but rather, on the ground - specific to each wing. Available in black painted steel.